Known for being Tigertailz vocalist between 1984 and 1988, Steevi Jaimz built up a real cult status in the Glam Metal Scene. Stevie is a true believer of the hair metal genre and always keep hanging around the scene and released his latest album, 'My Private Hell' back in the year 2009. An album that proved us the Glam Metal is still there! So I thought it was time to ask the man himself some questions about his career and if there is still a chance to see Steevi back in the Tailz and if he’s currently working on some album and/or project. 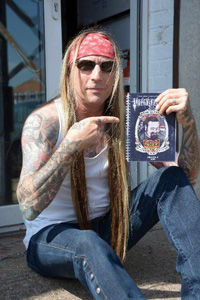 The Glam Metal Legend spoke to Headbangers Zine, who kindly shared it with Lords Of Metal. First of all, thank you for taking the time to do this interview! Please introduce yourself to the readers! What should all glam fans know about Steevi Jaimz? Hi. I'm Steevi Jaimz, best known as the original frontman of UK glam metal band Tigertailz. I released 3 solo records, the most recent being My Private Hell. Tell me about the early days? How did you discover hard and heavy music? What was your first hard rock and/or heavy metal record and what was your age at that time? I was introduced to rock n' roll at an early age. My dad was always playing music. All the old standards and his favourites. Eddie Cochran, Jerry Lee Lewis etc... Later down the line, when I was about ten, he gave me his copy of Led Zeppelin's first record. I loved it. But, the first record I remember actually buying was Paul McCartney and Wings - 'Band On The Run'. Still one of my favourite albums to this day. no glam metal band but traditional NWOBHM and how did you get into the glam/hair metal music? Treason was my first outing as a singer/frontman. It was a local band, that played heavy music. NWOBHM was in full swing, and we wanted to emulate our fave bands at the time. Diamond Head, Angelwitch, Leppard etc... I met Ace by accident, we both auditioned for Treason the same night. Joined the band, and the rest is history. After things not working with Treason, band members going by the wayside and other various reasons. We wanted to take it up a notch. And after placing an ad in Sounds Magazine I believe. I got a call from a guy named Phil Vokins. He came along to the audition and absolutely blew our minds. Just a really great guitar player. He had something we hadn't heard before... Treason was dead, and Crash KO was born shortly afterwards. We changed our image, music, and I guess that's where the glam thing began for me. Just curious; how did your family react to all the make up and clothing you were wearing? Because of the band I was in, they were fine. And to be honest, it was nothing new to them at all. What is the thing you most miss about the glam era? How was the scene in England for glam stuff? Were you ever disappointed you were born in the United Kingdom and not in Hollywood? Is it hard to survive as a European glam metal musician? You know. I really don't miss much about it at all. It became ridiculous, embarrassing and way too overblown by the end of the 80's. It needed taking down. The only songwriter I really admire from that 'Sunset Strip' era, who was a class above in my opinion, was Jani Lane. In hindsight, I'm glad grunge came along and kicked it into touch. Yeah, the scene in England was good. Nothing like Hollywood, but good. And I have to admit I had some really great times doing what I was doing. You know what. Glam rock to me was always Slade, Sweet, Bowie etc... and the 1970's. 80's glam bands weren't anywhere near as great as those bands. I don't think anything I have done recently is 'Glam'. I just get lumped in with that because of my Tigertailz connection. I personally class 'My Private Hell' as a great rock record. Of course I'm not disappointed with being born in England. You released your latest album 'My Private Hell' back in 2009! How did the album sell and are you currently working on something new? It did great for an indie release with poor promotion nearly zero advertising. It was totally ignored by 99% of the so called Rock mags in the UK. I'm still very proud of that record. And, as I said, I'm back recording with Phil. Do you write all of your own material yourself or do you deal also with other musicians and songwriters? What are the usual topics you like to use in your lyrics? I have always written lyrics, Loved doing it from day one. All of the first Tigertailz record were my lyrics and melodies, except for She's Too Hot. My Private Hell was a complete collaboration with Chris Laney, Anders Ringman and myself. I use all kinds of topics. Lots from things I've experienced in my life, dreams and so on... Depends on the day I guess. You were Tigertailz vocalist between 1984 and 1988, why did you leave the band just one year before they released the classic 'Bezerk'? Did you write some songs / lyrics for that album? How did you feel leaving the band just before they released their most legendary album, with video’s on MTV and international Tours? I didn't leave, I was fired. Hahahahahahahhahaha. I never had anything to do with their second record. Not lyrics or songs. About touring! When can we expect to see you around in The Netherlands or Belgium or Germany? Are there any plans to hit the stages again? No... There are no plans for any shows at the moment. But never say never! What can you tell us about the hair metal days in the eighties? The life on the road, all the booze, drugs and all the girls? Was it a good time for you? It was a wild time. Times of excess and complete madness!! I can't count the times we all crammed into a van and went up and down the motorways of the UK playing shows. It was hard work, but it was mostly fun. We were the number one glam band in England at that time. Booze, drugs and girls... What do you think!?!? Hahahahahahaha. Yeah, it was a great time for me personally. Not always, but on the whole really great. Are there any bands that didn’t get the credit they deserved in the 80’s in your opinion? Two bands instantly come to mind. Icon and King Kobra. Icon's 'Night of The Crime is such a great record. And should have been huge. And the first King Kobra record was sensational too. Was lucky enough to see King Kobra twice on the Ready To Strike tour. Great bands, great players and great songs. I'm sure there are a couple more, but can't think of any. What about the killer young bands that are around nowadays? Do you still follow some and do you have any favourites? What do you think about new bands like Crashdiet or Reckless Love? Got to be honest. I really don't follow it anymore. I certainly don't have any favourites. Been there done that type of thing. But good luck to any of them flying that particular flag these days, it's tough out there. You’re from England! Do you like football and what’s your favourite team? Do you visit matches? I ask this because I am crazy about English football and like to know it haha.. When I was a kid I lived and breathed Football. I loved playing, watching and everything about it. Unfortunately, as with everything these days, money has taken over, and as a sport it just isn't the same. I only ever went to one game, that was back in 1970! Are you currently working on new projects and how about a chance to see you back in the Tigertailz? I'm currently recording with my friend and fellow Crash KO bandmate Phil (Vokins). So I've gone full circle now. We're about to release something, and we're very happy with it. Long may it continue!! No, there's no chance of ever seeing me back in Tigertailz. Okay, then what are your top ten hard rock/glam/AOR or heavy metal recordings of all time? And are you also into extremer kinds of metal like thrash and/or death metal? I saw an old photo from you with Destruction shirt hehe! I like Anthrax and early Metallica. 'Ride The Lightning' era. Yeah, I did indeed wear a Destruction shirt at a Tigertailz show, at The Astoria in London. Last thing I like to know! You still look very glam and believe in this kind of music. But is there also another Steevi who’s maybe married and got any children? How does your life look like at the moment and does your loved ones share the passion for 80’s hard rock? I keep my private life private. Simple as that really. Thank you for your time, any special words from you to finish this interview?